Knowlegable, professional and were so pleasant to work with. The installion crew, Scott and Chris were great and so excited about the product and about informing us of the their progress with their smooth and pain free installion. Our wood floors are beautiful. Eric the owner informed us of a wood product that no other flooring company had mentioned and this was a great suggestion for us. He was involved from start to finish and educated us on the care and warranty. Great Job !!! 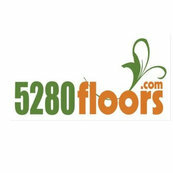 Thank you 5280 Floors for doing such a great job refinishing our floors. We specifically looked for a Bona Certified company and so glad we found you.